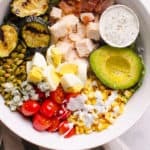 I’m an unconventional cobb salad eater. Not only I tried it first time in Disneyland, I also used the “wrong” dressing in creating my version. But if you ask me, I don’t see much difference between a chef’s salad and a cobb salad, and my healthy ranch dressing pictures needed an update. It is hard to glorify eating high in saturated fat bacon, eggs and blue cheese. 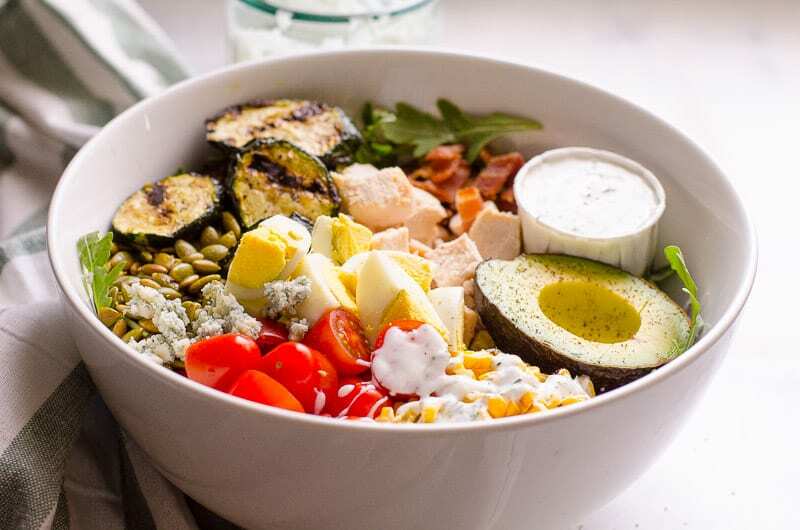 However, by using less of before mentioned oh so yummy ingredients and more of fiber and nutrition rich vegetables and seeds, and by using very low fat, sodium and calorie dressing, this healthy cobb salad is a decent compromise. Because I believe life is too short not to eat or to die from a heart attack. Either path isn’t a viable solution. 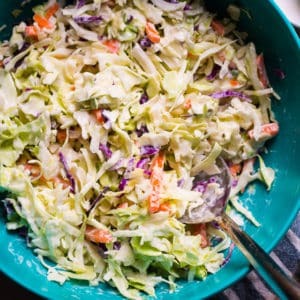 I have to say it’s not the quickest salad I have ever made BUT it lasts for days and is perfect for fridge/freezer clean out! Well, haha, what’s in MY cobb salad you mean? Anything but a kitchen sink. Healthy Ranch Dressing – My recipe that is 10 times less calories than store bought. Greens – Use vitamin and nutrients rich like arugula, baby kale or spinach. They offer way more health benefits than iceberg lettuce. Chicken – I usually use my Instant Pot frozen chicken recipe but boiled, baked chicken breast, grilled chicken breast or even rotisserie chicken (“hello”, real life) is fine. Corn – Grill without husk turning slowly every few minutes, boil or I love Instant Pot corn in 2 minutes. Thawed previously frozen corn is just as fine. Bacon – Panfry just 3 strips until crispy and drain on paper towel. Pumpkin Seeds – They add healthy fats to keep you full longer. Panfry on low-medium after bacon (drain the fat from the skillet) until fragrant, stirring frequently. Grilled Vegetables – Just like with pumpkin seeds, this is where your nutrition boost is at. 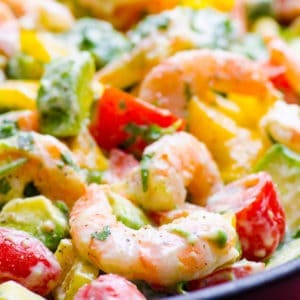 Drizzle firm veggies like zucchini, bell pepper, mushrooms with salt, pepper, olive oil and garlic powder to taste. Grill on medium heat until nice grill marks appear, turn and grill more. 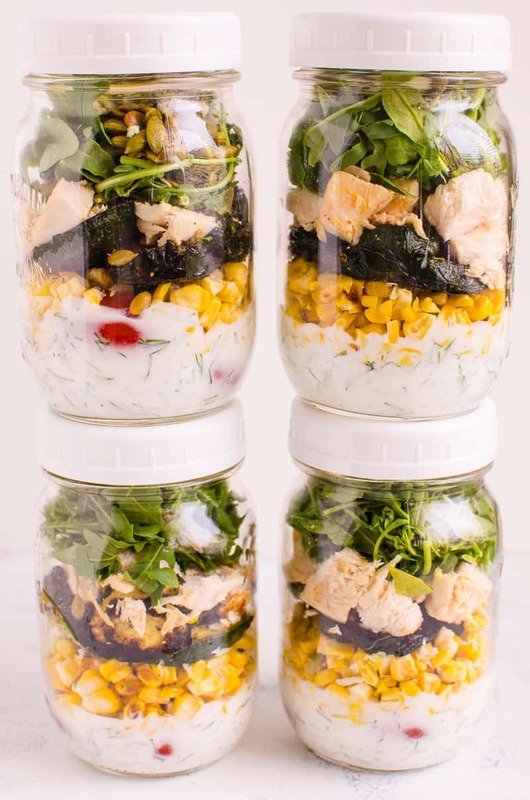 Salad in a jar is convenient lunch or summer meal on-the-go option. Think picnics, camping, boating. I have to say it’s work though. What good isn’t?! I would add avocado before consuming or skip. Just assemble above mentioned goodness. 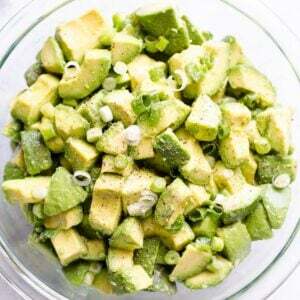 You can keep salad separate from dressing in the fridge for up to 5 days. 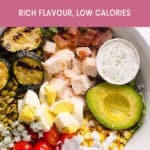 Healthy Cobb Salad Recipe with all the goodness of bacon, eggs and blue cheese but with extra nutrition and healthy easy dressing. We also show you hot to make it meal prep (salad in a jar) style. 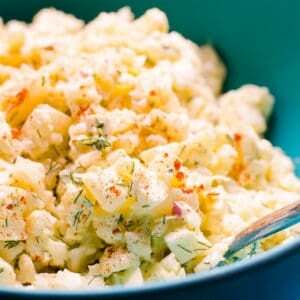 Healthy Ranch Dressing: In a small jar with lid add yogurt or buttermilk, dill, garlic powder, salt and pepper. Stir with a fork or shake the jar well. Set aside. Chicken: I usually use my Instant Pot Frozen Chicken recipe but boiled, baked chicken breast, grilled chicken breast or even rotisserie chicken (“hello”, real life) is fine. Corn: Grill without husk turning slowly every few minutes, boil or I love Instant Pot corn in 2 minutes. You can also use thawed frozen corn. Bacon: Panfry until crispy and drain on paper towel. Pumpkin Seeds: Panfry on low-medium after bacon (drain the fat from the skillet) until fragrant, stirring frequently. Grilled Vegetables: Drizzle firm veggies like zucchini, bell pepper, mushrooms with salt, pepper, olive oil and garlic powder to taste. Grill on medium heat until nice grill marks appear, turn and grill more. 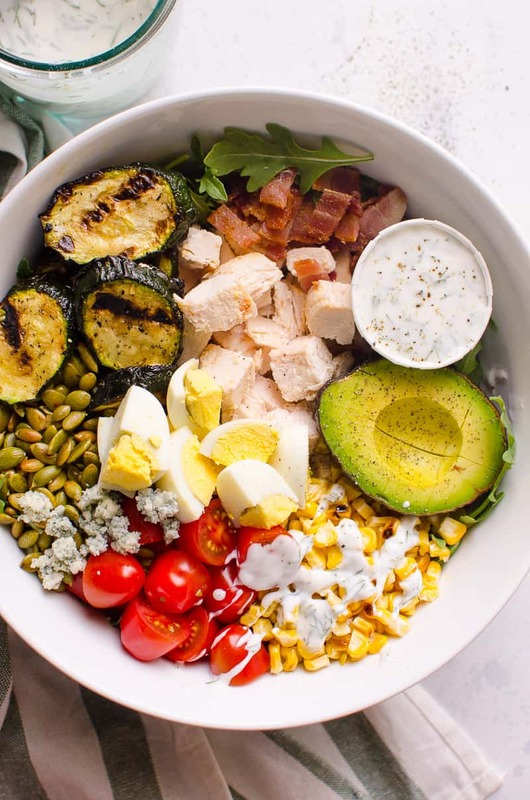 Assemble healthy cobb salad by combining all ingredients in a large bowl and drizzling with ranch dressing. 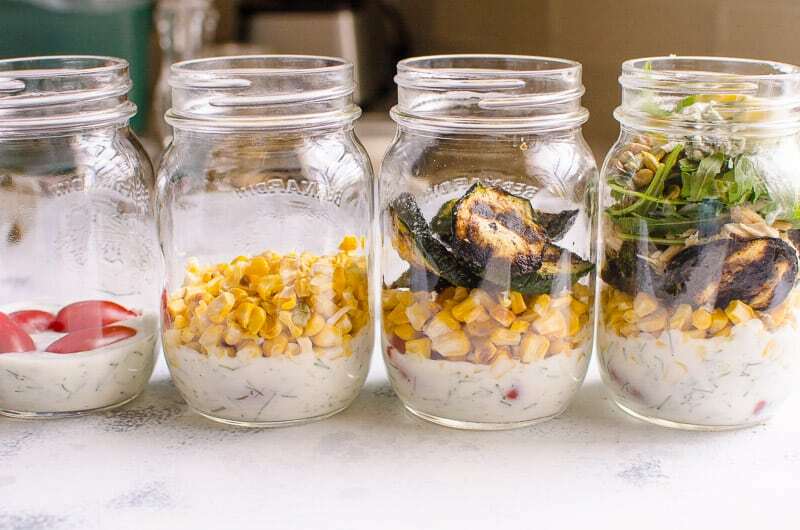 Healthy Cobb Salad Meal Prep Style: This is an order of layering salad in a jar to avoid soggy salad: dressing, grape tomato (uncut), corn, grilled veggies, greens, bacon, egg, pumpkin seeds. I would add avocado before consuming or skip. 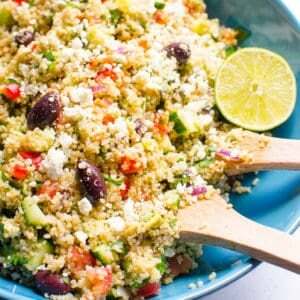 Excellent recipe with amazing dressing!